Old Trafford witnessed a mixed afternoon of football on Saturday, as Manchester United won 2-1 against Watford. A first-half goal from Marcus Rashford got the home side going, while Anthony Martial scored in the second half to give them breathing space. Watford, however, waited until the end to insert some tension, as Abdoulaye Doucoure netted a goal in the 90th minute. 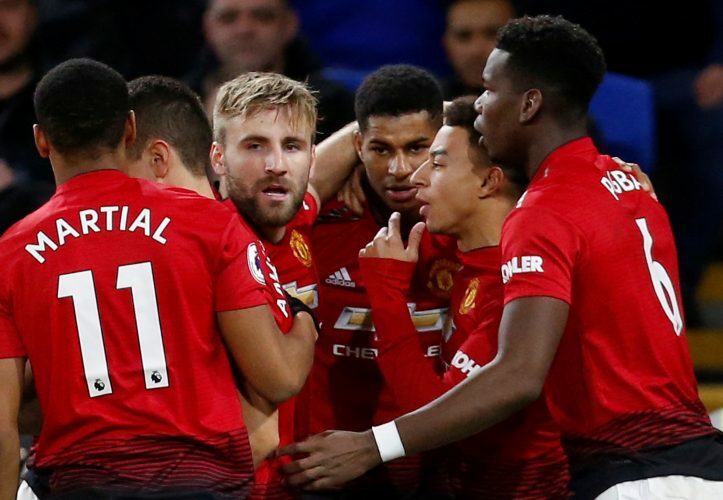 The win takes the Red Devils to the 4th place in the league table, tied with 3rd placed Tottenham, although this appears to be a temporary holding. Watford will certainly be disappointed with how the game turned out in the end. Ole Gunnar Solskjaer will be fully pleased with how his start to life as the permanent gaffer of Manchester United has commenced. Even though the performance wasn’t the best under his tutelage, it was nevertheless a crucial win that will come handy for their top-four ambitions. However, it goes without saying that it may come down to the last week before that particular race is fully settled. Even though they now sit within the Champions League berth, tied at points with Spurs, United may have faltered big-time with their loss against Arsenal. Further, the disadvantage they hold in terms of goal-difference may prove to be quite costly at that point in the season. Shaw was arguably the most prolific and offense-minded player on the pitch for the entirety of the game. His assist for Rashford’s opener, in particular, was a brilliant piece of football. The full-back could have easily chosen the easier pass and played the ball to Martial. Instead, the prodigal Englishman opted for the more difficult pass, and deployed a through-ball to Rashford instead. This act alone would have redeemed him from his errors in the past two losses that United suffered. Needless to say, Solskjaer will be eagerly hoping that Shaw is able to replicate such performances more often in the future. It came in particularly handy as injuries had forced the Norwegian to field a makeshift frontline, and the presence of Shaw often acted as an added offensive presence. The visiting side will be thoroughly frustrated regarding how this game turned out to be. They were undoubtedly the better side for much of the game. With 20 shots attempted to United’s paltry 8, it is easy to see just how disheartened they may get. Besides, they showed a deep hunger and bouts of creativity to try and win the game, the nature of their late goal illustrating as much. The manager should notch up this performance not as a loss, but instead, take it up as a massive positive and learn from their errors at Old Trafford. Considering where they are poised in the Premier League table, big things could be expected of them in the seasons to come. Yet another game has proven just how badly United require a foolproof defender in the upcoming transfer window. Chris Smalling, despite his aerial brilliance, was a sore sight, and was often poor on the ball. Phil Jones seemed to be contributing to the game solely by screaming at his holding midfielders for not securing the backline – a task that he ought to be fulfilling with great ease. United clearly missed the build-up and intensity that Victor Lindelof brings to their lineup. A specialist centre-back has to arrive at United, else the blunder that resulted in a late goal being conceded and an easy clean sheet being given away will continue to plague the Red Devils. Ole’s golden boy just keeps scoring. This is the first time he has reached double figures in the Premier League, and the lad is still listed amongst United’s U21 talents in their official league roster. This goes on to further highlight the sheer potential he is brimming with. Rashford, Mancunian to the fullest, will likely be poised for great things at the Theatre of Dreams in the years to come. Moreover, the sheer prolificacy of his scoring may worry Romelu Lukaku quite a bit, as the Belgian may never retain his position as the Red Devils’ go-to no.9. In fact, United should double-down in their reward for Rashford by tying him down to a long-term deal immediately. With Barcelona on the lookout for a potential Luis Suarez replacement, the English giants can’t take any chances.